Don't you just love it when something beautiful pops up that you don't remember planting? Now I know I had to have bought this on eBay, but my records don't show buying anything that fits the description of this beauty! That's ok, I like it. Got up very early on Mother's Day and planted my tomatoes and peppers. Then spent 4 hours making cages out of 3' galvanized fencing. Got 18 cages out of a 50' roll ($27). The iris is grand, and I like your frugal cage making, I made some out of the left over wire from a concrete pour. OO that iris is a real eye popper!! I certainly wouldn't mind if a few of those appeared in my garden. 18 cages for just $27 - that's got to be well worth the effort of making them. Well done!! 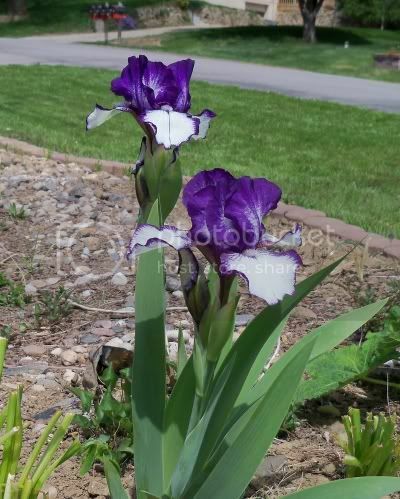 That is a beautiful iris!